Join up with the Flying Pigeon LA crew and a large group of neighbors as we parade our bikes down to the CicLAvia route this Sunday! Meet at the shop (located at 3404 N. Figueroa St., Los Angeles, CA 90065) on Sunday, October 7, 2012 at 9:30 a.m.
We ride for CicLAvia’s start in Chinatown at a little before 10 a.m. There is plenty of street parking around the shop. We are located right next to Antigua Cultural Coffee House – a good pre-ride hangout spot. Please bring: a functioning bike, skateboard, or rollerblades. 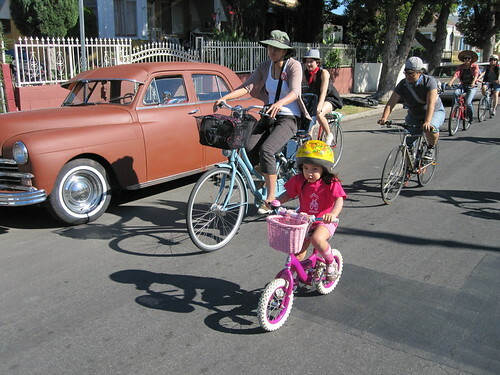 If you have an old clunker in the garage – bring it to our shop ASAP, before CicLAvia. If you are walking to the start of the route, we recommend taking the super secret staircase between the 110 freeway. it will drop you off at the start point to CicLAvia.